Tying in many of the key '17 Topps Baseball releases, 2017 Topps Rediscover Ultimate Card Giveaway centers around a huge assortment of stamped buybacks inserted in multiple 2017 products. Featuring original cards from throughout the card maker's history, the program offers over two million previously-released cards. Although buybacks are not new in the hobby, or with Topps for that matter, 2017 Topps Rediscover Ultimate Card Giveaway updates the previous model by marking most of the buybacks with a Rediscover Topps foil logo. The overall checklist is dotted with offerings from the 1950s all the way up to 2016. There is also tiered rarity which means several different levels of foil stamping so collectors have an idea about which buybacks are less common. And, in response to hobby feedback, the more valuable buybacks will not include any stamping. Starting with 2017 Topps Series 1 Baseball, the specific foil rarity begins with Bronze as the most common. After that, in order of increasing rarity, Silver, Gold, Blue, and Red (the rarest) close out the options. While issued as redemptions because of sizing issues, the 1950s-era cards will not be stamped. Shop for 2017 Rediscover Topps Buybacks on eBay. Averaging approximately 1:6 packs across the entire run, the 2017 Topps Rediscover Ultimate Card Giveaway buybacks are included in many of the major 2017 sets. It is important to note that these are incremental inserts and will not take the place of any other cards. In addition to the actual buybacks, 2017 Topps Rediscover Ultimate Card Giveaway incorporates a promotional aspect with code cards. Also falling at around 1:6 packs, these are eligible for prizes through the Topps site. Beyond this are limited redemptions for Topps Now cards and exclusive Topps Bunt issues. Much more limited are the Topps Now Golden Ticket redemptions. Shop for 2017 Topps Ultimate Giveaway code cards on eBay. 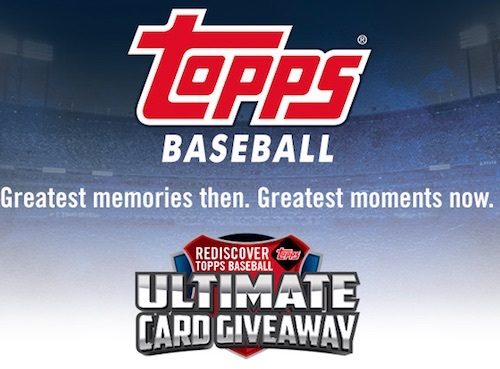 Check back here as more information is provided for 2017 Topps Rediscover Ultimate Card Giveaway. A full list of the participating products can be seen below. When available, the links go straight to the comprehensive product profiles for each set. Two issues w/the buyback cards. #1 is that I’m colorblind. I have a stack of cards I pulled from a case that I have no idea if they are red, bronze or gold. Some look slightly different, but I don’t know which are which. #2 is the rarity. Black is supposed to be the most common followed by blue. I pulled exactly 0 black, 3 blue, 21 silver and 48 red/bronze/gold (see #1). Rarity seems to be somewhat inverted from what is listed. Personally I don’t collect them, but I understand the attraction and it makes it interesting opening packs and seeing what might be in there for a ‘throwback’ card. Looks like you were correct about the rarity being off. Topps just updated them and it switched around everything. The code cards are a complete rip-off. If you have a winning code, it takes you to a login screen. After registering/logging in, there is no way to redeem the code. The redemption page tells you the code has already been used. Going back to the original screen now tells you the code is not a winning code. Entered 12 codes — had 2 winners — getting 0 cards out of it. Waste of time. I’m having a tough time deciding if a card is a gold stamp or a bronze stamp. Anyone have a tip to decipher? Saw two donruss cards on eBay with the “REDISCOVER TOPPS” stamp, any ideas about these? Topps bulk-stamped a bunch of buybacks and some non-Topps cards slipped in. 2017 Topps Ultimate Giveaway code cards, complete waist of time so far, 20 cards no luck. What are the odds again on these? So I got Rediscover Topps cards for Eddie Milner and Jody Davis. Can these cards be redeemed for other cards? I’m confused. Thank you for your assistance with this!! The Rediscover cards are stamped buybacks of earlier releases. These are not redeemable for anything else. How do I send in topps rediscovered buy backs? The Rediscover stamped cards are buybacks from previous releases and cannot be redeemed for anything else. Did they do the rediscover topps for topps pro debut cards or is it just the flagship cards? All products included in the promotion are listed above based based on information from Topps. Pro Debut is not included. That is what I thought but when I posted on another site almost everyone said that they were. I bought this card. It is jordan danks 2011 topps pro debut with rediscover topps. I spent a whole $1.99 on it and to me it was worth it. I thought you were asking if the Rediscover Cards were in 2017 Topps Pro Debut. Congrats on your purchase. So then Topps pro debut cards were meant to be stamped. 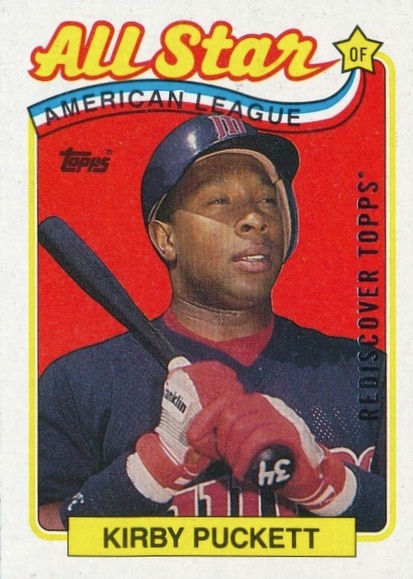 I have not received a single Rediscover Topps card that was not some late 80’s-early 90’s common card. Big freaking deal. I probably have 10-20 of each of those cards. I’d like it to even get ONE card from the 70’s or 80’s, even if it is a common card. Looks like Topps is just clearing out their warehouse of the garbage. I just got an ultimate card giveaway redemption card “congratulations” type insert as opposed to the blue cards. So I’m assuming that this will be one of the 1950s era cards. I’ve submitted the code on the Topps website and with my pending status am awaiting news. Hopefully it’s a good one. Just found a Edgar Renteria Rediscover Topps Red Foil. Wondering if it’s to late to get anything out of it. Not sure why I’m just now noticing it, but looks like I missed the buy back. Any help would be appreciated.